Kashan is a city in the Isfahan province of Iran. Kashan is the first of the large oases along the Qom-Kerman road which runs along the edge of the central deserts of Iran. Its charm is thus mainly due to the contrast between the parched immensities of the deserts and the greenery of the well-tended oasis. Archeological discoveries in the Sialk Hillocks which lie 2.5 miles (4 km) west of Kashan reveal that this region was one of the primary centers of civilization in pre-historic ages. Hence Kashan dated back to the Elamite period of Iran. 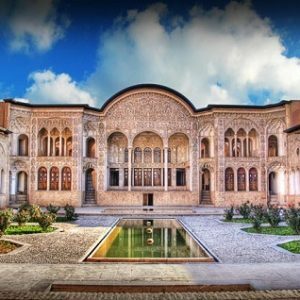 After world known Iranian historical cities such as Isfahan and Shiraz, Kashan is a common destination for foreign tourists due to numerous historical places. The etymology of the city name comes from the Kasian, the original inhabitants of the city, whose remains are found at Tapeh Sialk dating back 9,000 years. Later this was changed to “Kashian”, hence the town name. 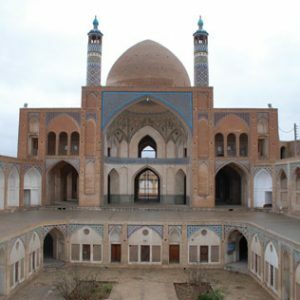 Between the 12th and the 14th centuries Kashan was an important centre for the production of high quality pottery and tiles. Kashan is cited in the neighbor-hood of two of highest peaks of Karkas chain, Mount Gargash to the southwest of Kashan (the home of Iran national observatory, the largest astronomical telescope of Iran) and Mount Ardehaal in the west of Kashan, also known as “Damavand of Kashan” and the highest peak of Ardehaal mountains (end part of Karkas chain in central Iran). Kashan is internationally famous for manufacturing rose water, carpets, silk and other textiles. Kashan today houses most of Iran’s mechanized carpet-weaving factories, and has an active marble and copper mining industry. There are a few things must-do in Kashan: Make sure to visit the traditional bazaar and walk around a bit in the streets to catch the feeling of an Iranian town on the fringe of the desert. 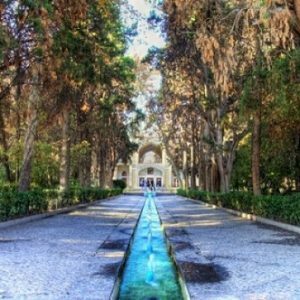 Make sure to visit Fin garden and, if you happen to visit Kashan in the right season, the rose gardens in the suburb. And, of course, visit the historical houses. One of the most beautiful historical gardens of the middle-east and the world. It contains Kashan’s Fin Bath, where Amir-Kabir a famous vizier of Qajarid was murdered by the King Nasereddin Shah. The garden covers 2.3 hectares with a main yard surrounded by ramparts with four circular towers. In keeping with many of the Persian gardens of this era, the Fin Garden employs a great many water features. It’s one of nine world heritage Persian Gardens. 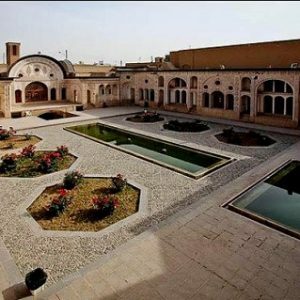 The house of Boroujerdi, belonging to a trading family who migrated to Kashan, was built over a hundred years ago. The construction date can still be seen on the covered inscription of the building, completion of which took 18 years of work by tens of laborers, architects and master painters. Since exceptional attention has been paid to all minute architectural details demanded by the geographical and climatic conditions of the area, the house has attracted considerable attention of architects and recognition from Iranian and foreign scientific and technical teams. A large house with several courtyards, which once belonged to a wealthy merchant. Experience how well the wind towers work. It consists of delightful wall paintings with elegant stained glass windows and includes other classic signatures of Traditional Persian residential architecture such as biruni and andaruni. This historical mosque was built in the late 18th century by master-mimar Ustad Haj Sa’ban-ali. The mosque is not in use any more, the theological school in its basement is, however, active. It was here where Ustad Ali Maryam as a pupil started his career as a brilliant architect.